Dimitri Desiron (Antwerp, Belgium, September 30, 1971) attended classical drawing classes between 1983 and 1989 at the Academy of Visual Arts in Brasschaat near Antwerp, obtained a Master's degree in translation (French-Spanish-Dutch) in 1994 at the Antwerp Institute for Translators and Interpreters (currently part of the University of Antwerp Faculty of Arts) and worked several years as an in-house graphic designer (mainly for Banksys, now Atos Worldline), until he decided to dedicate himself to what he loves most - painting. 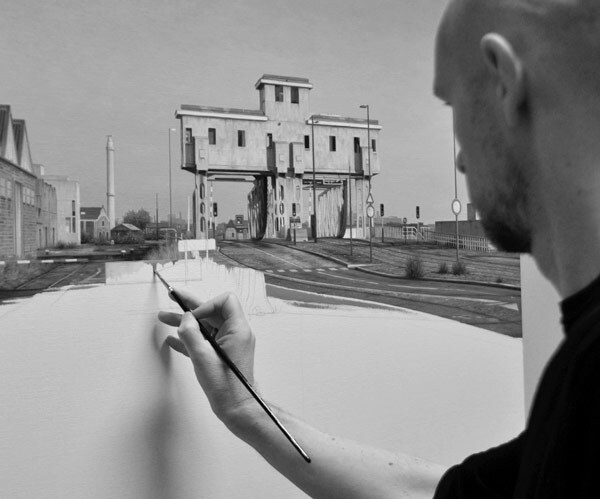 In his paintings, he depicts a quiet, introspective world, largely inspired by his immediate urban environment. Light is a key element in the choice of his subjects, and his sense of detail pushes him to an ever ongoing search for hidden beauty in architectural elements and textures, going from stone façades and steel constructions to ordinary railways and roads. All paintings are executed in oil on canvas or panel.